If you want the Blue Bowl Concentrator (otherwise known as the D.A.M. 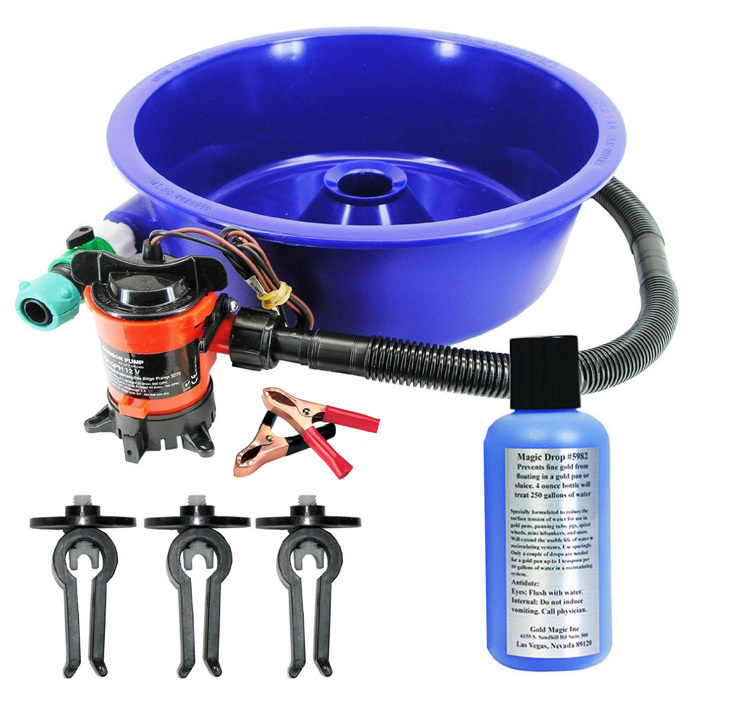 Gravity Concentrator) to operate as a 12 volt recirculating system, this Blue Bowl Concentrator Deluxe Kit has everything you need and then some: a 750 gallon per hour 12 volt pump, three feet of 3/4 inch flex hose, a pair of battery clips, set of 3 leg levelers with clips, 1 bottle of Magic Drops, and instructions. You will also need a five gallon bucket (not provided). Order early as this is a VERY popular product and might incur a 1-2 week back order due to high seasonal demand. The 3 plastic leg levelers attach the Blue Bowl Concentrator to the top of a 5 gallon bucket. You can perfectly level the Blue Bowl by turning the adjustment nuts on each of the 3 levelers. The 4 fluid ounce bottle of Magic Drops is to prevent fine gold from floating. It is specially formulated to reduce the surface tension of water with minimal sudsing. Only a couple of drops are needed for a Blue Bowl and up to 1 teaspoon per 10 gallons of water in a recirculating system. Use sparingly! A 4 ounce bottle will treat up to 250 gallons of water. Bottle is about 5 inches tall and 2 inches in diameter. Magic Drops are also ideal for use in gold pans, panning tubs, jigs, spiral wheels, mini highbankers, etc.